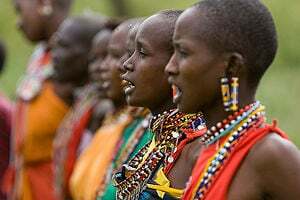 Women from the Masai tribe, singing. The music of Africa is as vast and varied as the continent's many regions, nations, and ethnic groups. The African continent comprises approximately 20 percent of the world's land mass and has a population of roughly 934 million. African music is as diverse as its cultures and peoples and has flowered in many indigenous forms as well as been shaped by foreign influences. Although there are many different varieties of music in Africa, there are a number of common elements to the music, especially within regions. The concept of music in Africa, especially in sub-Saharan Africa bears a difference from other regions and cultures. The roles of music and dance are tightly woven together in sub-Saharan Africa, and music intersects with every aspect of life, expresses life through the medium of sound. By helping mark the important moments in life, music helps to underscore the divine and eternal value of human life. African music also helps to connect people together in a variety of ways, strengthening the fabric of the community, which in turn reinforces people's commitment to support each other and the community, toward mutual health and prosperity. Another crucial role of music in Africa is as a mode of communication. Talking drums, signal drums, songs, and the sagas of the historian griots each communicate different types of important information. As African society has changed in response to the forces of colonization, independence, and globalization, the role of music changed as well, adapting to the new situation in which the people of Africa find themselves. Though there have been changes in some of the forms of the music, including the infusion of instruments, musical styles, and genres from outside the African continent, music remains very important in Africa today. Also, as Africans traveled from Africa to other parts of the world, both as a result of African slave trade and later migrations, the music and dance forms of the African diaspora have influenced a number of international musical styles and genres, including many Caribbean and Latin American music genres like rumba and salsa, as well as providing the foundation of musical tradition behind African American music. 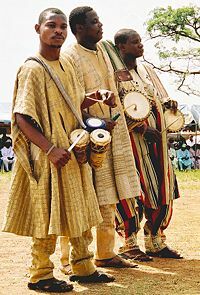 Drummers, part of a large celebration marking the arrival of running water to their village, Ojumo Oro, Kwara State, Nigeria, in April 2004. When discussing African music, the term "traditional music" is used to refer to the characteristics of African music prior to the colonization of the continent by European countries, which was most widespread during the late nineteenth century. This pre-colonial period was full of social changes and dynamism. Great African empires and kingdoms rose and fell, many of their traditions and cultures still prevalent to this day throughout African villages. Because of the extensive Arabian influence of the music on north Africa, which gives it a separate and distinct style, this discussion will be focused on the music of sub-Saharan Africa, which shares many characteristics from region to region. A great deal of African traditional music as it occurred in African life and culture throughout the years, was performed by full-time musicians. Although the terms "traditional music" and "folk music" are often used interchangeably in the literature describing this music, the term "traditional music" is more accurate, because some of it belongs to court music or sacral music traditions, therefore the term "folk music" is not always appropriate. Music is an integral part of African ethnic life, accompanying many kinds of events, including childbirth, marriage, hunting, and even political activities. Many cultures use song and dance to ward off evil spirits, and pay respects to good spirits, the dead, and ancestors. 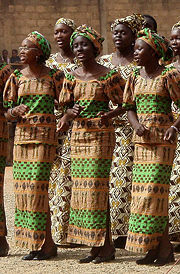 The majority of sub-Saharan African folk music and traditional music is functional in nature. There are, for example, many different kinds of work songs, ceremonial or religious music, and courtly music performed at royal courts, and typically none of these are performed outside of their intended social context. Despite their diversity, traditional African musical forms share some common traits. The emphasis is placed more strongly on rhythms than on melody and harmony. Repetition is use as an organizing principle on top of which improvisation is built. African music is mostly performed by groups of musicians, frequently employing polyphony, polyrhythm, and a conversational style of music and interlocking. The most frequently used form in African musical traditions consists of the use of ostinato, or repeated short musical phrases with the accompaniment of melodic-rhythmic patterns. For example, in the call and response method, a leader usually sings a phrase with a chorus singing back a response. Two or more melodies may be combined to form larger sectional formations. Contrast is achieved through a series of musical movements or “acts,” each consisting of a section repeated several times. Rhythm is the most distinguishing characteristic of African music tradition. Four basic elements characterize African rhythmic structure. They are an equal pulse base, a metric time arrangement, a specific organizing principle unifying a diversity of simultaneous rhythmic patterns together, and an exact starting point for rhythmic groupings. African music, from the communal nature of African society, is marked by the simultaneous sounding of two or more pitches. Melody and rhythm are interwoven within this dense structure of various instrumental and metric combinations. Ornamental devices, either vocal or instrumental, are commonly used to create additional layers, providing a richer density to the texture. Another important feature of African music is its related movements or body percussion, such as hand clapping, foot stamping, and dance. Body movement is strongly encouraged by this type of music. African music is often used to transmit messages and ideas; and to record and recount historical events. Consequently, the meaning of the texts and their relation to the music especially important. Musician from the northern Nigerian Housa ethnic group plays a two stringed 'harp' made from half a calabash (gourd) covered in skin. The composition of African music employs polyphony. Polyphony is defined as the composition of multiple simultaneously sounding and rhythmically independent parts. In such a composition, the originating melody carries given more importance than the resultant harmony. The Zulu choral music of South Africa is an example of vocal polyphony. When this music is performed, individual voices will enter at different moments in a cyclic and continuous manner, giving rise to a complex and constantly shifting texture. Most African composition is based on the repetition of a musical unit. It is that repetition that holds together the other musical units of the composition. These other unit are structured with great freedom relative to the first unit, producing their own rhythmic pattern that coincides only occasionally with that of the other units and with the basic pulse. For example, in the mbira music of the Shona people of Zimbabwe, a repeated pattern is established by the interaction of various parts, and the musician develops an improvisation out of this core pattern. The call and response is a form of music composition wherein a vocalist or instrumentalist will sing or play a phrase and another vocalist or instrumentalist will answer with another phrase creating a lively exchange. Hocketing is the sharing of rhythmic or melodic lines between two or more players, one part resting while the other part performs a note or notes. An essential element of hocketing is integration—the working together and interlocking of the parts. In a more general sense, fast alternation short groups of notes between voices, instruments and timbres is a key element in the polyphonic and polyrhythmic structure that is distinctive to much of the music in sub-Saharan Africa. Besides using the voice, which has been developed to use various techniques such as complex melisma and yodel, a wide variety of musical instruments are used in African music. Elmina, Ghana. A West African man plays the kora, an African chordophone, of the resonator bow type. These include a wide array of drums. Drums used in African traditional music include tama talking drums, bougarabou and djembe in West Africa, water drums in Central and West Africa, and the different types of ngoma drums (pronounced by some "engoma") in Central and Southern Africa. Besides the numerous drums, African percussion instruments can be divided into two broad categories: Instruments with rhythmic functions and instruments with melodic functions. Large gongs, twin gongs, slit gongs, and ritual gongs; rattles and foot rattle; woodblocks, bells, and double bells are examples of instruments with rhythmic functions. Other percussion instruments used for rhythmic parts include shakers, such as the kosika, rainsticks, and woodsticks. The melodic instruments include string instruments, (musical bows, different types of harps and harp-like instruments like the Kora as well as fiddles), many types of xylophone and lamellophone such as the mbira and different types of wind instrument like flutes and trumpets. A more specific classification can be made by categorizing them into groups namely, chordophones, idiophones, aerophones and membraphones, following the Hornbostel-Sachs system of classification for musical instruments. Membraphones are instruments that produce sound by a vibrating membrane. The most prevalent type of membranophone, drums, are utilized as both melodic and rhythmic instruments and come in a variety of shapes and sizes. Some of these drums are beaten with the hand, while other are beaten with a stick or rubbed. Some are single-headed and some double-headed and they are played in ensembles of varying sizes. These include the ngoma kettledrums of South Africa, the West African hourglass pressure drum, bompili clay pot drums usually played by women, frame drums, and countless other drums are played throughout Africa. Drums of an African band in Germany. Drummer for a Rwandan dance troupe. Drum found near Lake Tengrela, Banfora, Burkina Faso. Burundi drummers, performing on drums carved from tree trunks. Village Drummers from a village on the shores of Volta Lake. Obu man playing a mouth bow. Photo dates from about 1910, Obubra, Nigeria. Chordophone are instruments that produce sounds with vibrating strings, sometimes plucked, sometimes struck, sometimes with a bow. One of the simplest and the most widespread of these instruments is the musical bow. Types of the musical bow included the earth bow, the mouth bow, and the resonator bow. An earth bow is made by planting one end of a flexible pole in the ground and bent it at an angle to the ground. To the end of the pole, attach a string and on the other end of the string attach a stone, or a small piece of wood which is planted in the ground. The mouth bow is formed of a string that is attached to both ends a flexible pole such that the pole is shape to form a bow with the string. The string is held in the mouth and struck on a spot along its length. The mouth will help alter the amplification of the original sound of the struck string. The resonator bow is a type of mouth bow, but with a calabash resonator fixed at the middle. The kora, a multiple resonator bow, is one of the most important musical instruments in West Africa, usually played by the griot, or village historian. The kora is made from a natural calabash cut in half and partially covered with cow skin, with a hardwood post running through it. Between twenty and twenty-five strings run the length of the instrument, passing over a bridge that rests on the stretched skin cover. Idiophones are instruments that produce sound by vibrating themselves, without the aid of a vibrating string, membrane or reed. These include the xylophone and many kinds of shaken, struck and scraped percussion instruments. Idiophones include both melodic and rhythm instruments, and the most abundant type of instrument found in Africa. The marimba is a melodic idiophone (Malawi). The African thumb piano, also known as the Mbira or Karimba. Rattles are shaken to create sound and are principally rhythm instruments. Of the many rattles found in Africa, two categories may be observed: Those rattles that are played by the hands and those that are worn on the body and shaken by the movements of the player's body. Those rattles that are played by the hands include the gourd variety which may be either container in nature (objects such as pieces of bone, bamboo shoots or metal placed inside a gourd) or may be surrounded by nets of objects such as sea shells or beads. Friction idiophones, such as pieces of notched bamboo, are played by scraping another stick across the bamboo. Other idiophones such as bracelets of metal or a notched stick being passed through a dried fruit shell also exist and are used to create rhythmic sound. Stamped sticks and stamped tubes also form another category of idiophones (in this case concussion idiophones). These sticks and tubes are held in the player's hand and performed by being held at an angle and striking the ground or a slab of stone at an angle. On occasion three tubes are played at the same time each of which is playing a different rhythm. The adenkum (a long gourd with one end cut open to allow for resonance) is a stamped idiophone usually played in the vertical position by hitting the ground. All of the above idiophones are rhythm instruments and play no melodic function. They may, however, be tuned to a complex of pitches or even to a specific pitch in some cases; for example, the adenkum. However, no attempt is made to use these instruments melodically by creating a graduated scale of pitches. 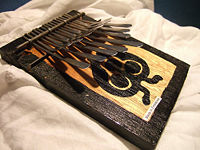 There are two basic types of tuned idiophones that can be used for playing melodies: The mbira or sansa ("hand piano") and the xylophone and the marimba. The mbira is made by arranging a graduated series of strips (wood or metal) on a flat sounding board and placed inside a resonating gourd or box. A unique quality is added to the instrument by the addition of rattling pieces of metal or possibly a chain of sea shells or other small articles to create noise. Mbiras may consist of from one to three manuals and range from five to twenty keys per manual. The Keys are attached to a sound resonator, either a hollow box, as in this case, or placed in an open large gourd to enhance the volume of sound. There are three main forms of tuned xylophones and marimbas found in Africa: (1) wooden slabs arranged in a graduated scale are mounted over a resonance box (a pit, a clay pot or an open trough may be used). Iboland in Nigeria and the Zaramo of Tanzania make xylophones of this type. (2) In the Kissi country in Guinea and in the Ivory Coast, xylophones are made by laying keys over two pieces of banana stems. (3) Gourd resonators are used to resonate keys placed above the open gourd and mounted in a wooden frame. These gourd resonating xylophones and marimbas are found in west, central and east Africa. Xylophones and marimbas may be played by themselves or in combination with other instruments. It is common among the Vatapa (Shona) of Zimbabwe to hear large ensembles involving as many as ten to fifteen players performing in large xylophone ensembles consisting of xylophones ranging in size from small (those that are strapped over the back and carried) to large (those that are large enough to have the player stand on a riser to reach). Bamboo flute players from Rwanda. African instruments include a number of aerophones, which produce sound by vibrating columns of air. The three broad categories of African aerophones are: (1) Flutes, (2) reed pipes, and (3) trumpets and horns. Although flutes may be made from a husk of cane or the end of an animal horn or gourd, the most common material in use to make flutes is bamboo. They may be open-ended or closed, they may be played in the vertical or horizontal (transverse) positions. 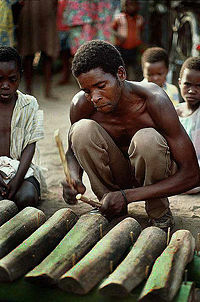 Although most African flutes are made with a number of holes (from two to six), some flutes are made with a single hole. A number of these flutes are made so that the technique of melodic playing known as hocket can be employed. Using the hocket technique melodies are formed by each flute sounding single tones in a melodic chain. Trumpets and horns are made from the horns of many animals which include elephant tusks and are used in various ensembles. Here again, instruments are often arranged in families. Babembe horns are made in human likeness in the Congo. In the case of the Babembe horns, a dorsal opening is cut in the back of each likeness and the player buzzes his/her lips to create a single tone. African musicians can be divided into three categories: The non professional, the semiprofessional, and the professional. Most African traditional music is a participative performance. There is a perpetual give and take between the main performer and the public, and the public is fully part of the performances. Tradition and culture helped each participant to know how it should respond to a particular rhythmic. Other people in the African society, even though not fully musician, have music as one of the requirements to fulfill their social responsibility. These include people like healers, who on certain occasions are called upon to perform sacred songs. The last group of musicians are the full time musicians. Often their position in the society is inherited. 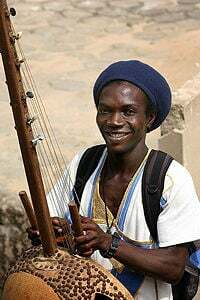 In the West African Malinke region, historian Griots are full time musicians who used to travel from village to village, singing for dignitaries and rich traders or merchants. As has been mentioned, North Africa—Egypt, Libya, Algeria, Tunisia and Morocco—has a distinctive musical style, different from the southern regions; this music bears a strong Arab and Islamic stamp thanks to medieval Islamic expansion. 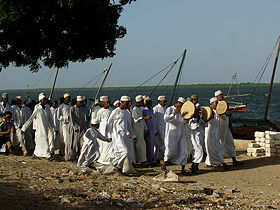 Islamic worshipers with African drums, Lamu, Kenya. African music and Christian traditions combine as Ethiopians celebrate the ancient Ethiopian Orthodox Christian festival of Timket. Egypt, in particular, has deep musical connections to the rest of the Arab world, being one of the epicenters of Arab classical and popular music for hundreds of years. While Arabic traditions are more preeminent, a Coptic musical tradition adopted from the music of the ancient Egyptian is also existent. Coptic music is characterized by a strong vocal and the use of cymbals and triangles. Moroccan classical music style is Arab-Andalusian, featuring an orchestra of traditional stringed instrument such as the rabab (a bowed two-stringed instrument), oud (Arab lute), and qanun (zither). Songs in Arabic often accompany this music. West Africa, below the expanse of the Sahara Desert, is one of the most musically fertile areas of the world, containing such musical powerhouses as Mali, Senegal, Nigeria, Ghana, and Guinea. Once the home to various Empires that grew rich from trans-Saharan trade, the region is home to some of the most sophisticated classical and court music traditions in sub-Saharan Africa. For thousands of years, professional musicians called griots played an important role as historian in the kingdoms that developed in the Saharan region of west Africa. 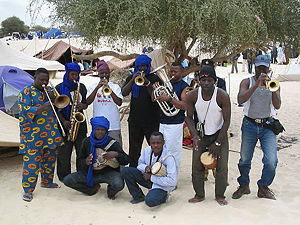 In addition to the griot, music in Senegal is also characterized by the complex drumming that often accompanies dance. East Africa also has deep musical ties to the Islamic world; from the Egyptian-influenced taraab music of the Swahili coast to the oud-driven music of the Nubian people of Northern Sudan. Additionally, Ethiopia and Eritrea have their own ancient, unique, and interrelated musical cultures that date back more than 1000 years. The khoisan (Angola, Namibia, Botswana, Swaziland, South Africa, Lesotho, and parts of Zambia, Zimbabwe, and Mozambique) is the anglicized name of two tribes, the Khoi and the San. The music of this area is simpler than the music of other African cultures, both in types and variety of instruments and stylistically. More prominent harmonically are vertical fifths and octaves alongside rhythms less complex than those of Western Africa. In fact, percussive instruments are not as prominent in the Khoisan area as they are in other areas of Africa. Remarkable, however, is the presence in the music of the "hocket" technique, where individual notes of a melody are sung by different musicians, and a technique similar to yodeling. Because of the nomadic nature of the people, the music is played throughout the day and not associated with any rituals relating to the harvest. Many African languages are tonal languages, leading to a close connection between music and language in many African cultures. In singing, the tonal pattern or the text puts some constraints on the melodic patterns. On the other hand, in instrumental music a native speaker of a language can often perceive a text or texts in the music. This effect also forms the basis of drum languages (talking drums). Nigerian dancers, with their own drums and other instruments. The treatment of "music" and "dance" as separate art forms is a European idea. In many African languages there is no concept corresponding exactly to these terms. For example, in many Bantu languages, there is one concept that might be translated as 'song' and another that covers both the semantic fields of the European concepts of "music" and "dance." So there is one word for both music and dance (the exact meaning of the concepts may differ from culture to culture). For example, in Kiswahili, the word "ngoma" may be translated as "drum," "dance," "dance event," "dance celebration," or "music," depending on the context. Each of these translations is incomplete. The classification of the phenomena of this area of culture into "music" and "dance" is foreign to many African cultures. Therefore, African music and African dance must be viewed in very close connection. The popular African music refers to the music with compositions started during the colonization and after the colonization era. The colonization era saw the emergence of a new urbanization. The cities where inhabited mostly by Africans who were working for members of the occupying country, primarily as servants, clerks, or cooks. People closer to the occupier where also ranked higher in the social ladder, and this precipitated the beginning of the decline of traditional African music. Traditional African music lost its appeal as these new urban dwellers and the occupiers brought new musical instruments and styles that were quickly adopted by Africans. Musicians did their best to mimics songs and and musical genres from the occupier’s country. One new genre of music, the Palm Wine, grew out the Krou people of Liberia and Sierra Leone. It was a genre played on the guitar by sailors while they enjoyed a glass of palm wine. As sailors, they traveled the west coast of Africa up to the coastal regions of today’s DRC (Democratic Republic of Congo) and on the way introduced the Palm Wine genre and the guitar to these regions. With the appearance of recording studio and the radio in 1924, musicians were now able to reach a wider audience. This also allowed new musical genres to spread more easily throughout the continent. The end of World War II saw a new trend in the African musical sphere, the importation of music from Latin America, like the rumba, chachas boleros, and the mambo. Musicians easily adopted these styles of music. They were well appreciated by the occupiers and also very close to their native musical style. This started a Latin craze, especially in the French colonies and the Belgium colony of Congo. This Latin craze helped shape and give rise to other new musical genres. Highlife, a new genre that originated in Ghana, holds E.T. Mensah as one of its hero. The highlife was a truly popular musical genre with influence that spread across the border of Ghana to other, mainly English speaking countries, like Nigeria. Highlife is characterized by jazzy horns and multiple guitars. In Congo, the melding of the palm wine style of playing the guitar with the Latin musical genre, led to the appearance of a style known popularly as the Congolese Rumba or Soukous with prominent figures like Antoine Kolossay (Papa Wendo), Joseph Kabasele Tshamala (Grand Kale), and Francois Luambo Makiadi (Franco). This style, like highlife, exerted a widespread influence in sub-Saharan colonized Africa. South African band, with a typical instrumentation of percussion, including marimba. The independence period, in the 1960s, was a vibrant period both politically and culturally for the emergence of a free and proud Africa. The hopes and many moments of disillusionment that followed were witnessed by African musicians. African modern musician have incorporated more freedom into their musical composition and begun to blend traditional music with foreign musical styles. The African style that emerged during the occupation developed and gave rise to new varieties and sub genres. Musicians reverted to the use local instruments and sang in their local languages. Thus, the music itself made its own contribution to the liberation of the African mind. In Guinea, Salif Keita, incorporating its electric kora, adapted and blended old traditional songs and instruments with modern instruments. Fela Kuti of Nigeria, around 1970, brought highlife to a new dimension and create a new genre, the afrobeat. Afrobeat is a fusion of stylistic elements from its own musical culture, afro-American pop music, and Latin American music, with a prominent modal jazz. Some lyrics in afrobeat were very critical of the ruling juntas, making some outspoken musicians into local folk heroes. Modern African music has developed further and national musical genres have emerged throughout the continent. Global musical styles such as jazz, R&B, hip hop, rock ’n' roll, country, and reggae have all make their impact on today's African musicians. Successful musicians are usually the one who successfully blend these foreign musical style with the musical traditions of their country. Hip hop started in the 1970s, among the black youth of New York. The lyrics and delivery style of hip hop borrow heavily, like most other African American style of music, from African tradition. A contemporary African band, combining traditional percussion instruments with contemporary brass instruments. Since the 1980s and early 1990s, Hip hop has entered the African scene and is now being adapted by African youth throughout the continent. At first, African hip hop artists were mostly mimicking their American counterparts, which gave a bad name to hip hop as a deculturalization and Americanization of the youth of Africa. In those early days, hip hop was more a style of the youth in the upper strata of the society. The second wave of hip hop artists took the musical style closer to home, creating local flavors of the hip hop genre, and singing in their local language. This period started in the mid 1990s, and can be called the Africanization of hip hop, with distinct styles emerging from country to country. In Ghana, the highlife merged with hip hop to create "hiplife." In South Africa, hip hop lyrics have been used to express the struggles of the youth in post apartheid society. Reggae music is well represented in Africa. The influence of reggae took firm root sometime after Bob Marley's concert in support of Zimbabwean independence in Harare in 1980. The main centers of reggae are South Africa, the Ivory Coast and Nigeria. The sound is aligned with current trends in African music and bands often experiment with the use of traditional musical instruments. Askia Modibo, a native of Mali, merged reggae with the pentatonic music of the region, the Wassoulou, on "Wass-Reggae" was released in 1995. The lyrics follow the tradition laid by Bob Marley back in Zimbabwe, very concerned with the society in which the artist is living and the problem of the world. Alpha Blondy, a native of the Ivory Coast, released an album in 1986, with the virulent title Apartheid is Nazism, asking for U.S. intervention to stop apartheid in South Africa. The music of the independence, like highlife and rumba Congolese, have further inspired and given rise to new local musical genres that are emerging in the twenty-first century. "Ndombolo" is a fast-paced derivative of "soukous." 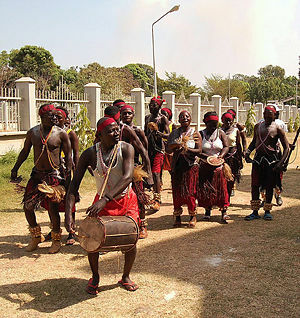 In contrast to the Congolese Rumba which has its origin in the fusion of musical forms, Ndombolo has its origin in the dance of the same name the Ndombolo (“Gorilla dance”). The dance was started as a satyr of the late regime of Congolese president L.D. Kabilla and soon became a continental craze. It is promoted by lead singers like Awilo Longomba, Aurlus Mabele, Koffi Olomide, and groups like Extra Musica and Wenge Musica, among others. 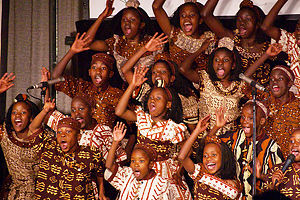 Watoto Children's Choir from Kampala, Uganda, founded in 1994. In the Ivory Coast, during the political riots of the 1990s, "zouglou," a new musical genre emerged with roots in the urban and the local youth culture. Zouglou originates from small groups of youth that performed during social get-togethers like football (soccer) competitions. 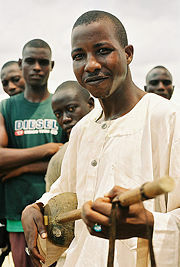 Using traditional percussive style, zouglou is especially popular with the Bete people of the Ivory Coast, because it bears similarities to their own local style, Alloucou. Zouglou groups formed bands, borrowing some elements from Congolese popular music. Zouglou lyrics heavily emphasize humor, wordplay, and sharp social commentary. This genre, which was promoted by bands like Les Garagistes, Magic System, Soum Bill, among others, gave rise to other local styles. The now famous coupe-decalle, mapouka, and gnakpa are all derived from Zouglou and can be heard throughout Africa. The global movement of world music is also present in Africa. This movement includes musicians who are experimenting with a wider usage of African musical composition and instrument mixed with foreign style of music. Manu Dibengo, jazz composer from Cameroon is one of the longest proponents of the fusion of African and foreign style of music. He is well known for his “Africanized” jazz composition since the 1960s. He will be renowned worldwide with its album “Soul Makossa” in 1972. Renown vocalist Cesaria Evora is from Cap Verde. She has popularized and brought to global recognition the Cape Verde traditional musical genre of Morna. In 2003, her album Voz Amor received a Grammy Awards for Best World Music Album. African music has been a major factor in the shaping of a number of American musical styles, including what we know today as blues and jazz. These styles have all borrowed from African rhythms and sounds, brought over the Atlantic ocean by slaves. Paul Simon, on his album Graceland used African bands and music along with his own lyrics. As the rise of rock 'n' roll music is often credited as having begun with 1940s blues music, and with so many genres having branched off from rock—the myriad sub genres of heavy metal, punk rock, pop music, and many more—it can be argued that African music has been at the root of a very significant portion of all contemporary music. This young man is playing the k'ra, a traditional instrument of Ethiopia. The name is very similar to the kora of West Africa. African beaded calabash rattles for sale in New York. Cow bells, a type of African percussion instrument. These dancers, at the Swazi Cultural Village, South Africa, are wearing rattles on their ankles. Singing group of the Masai Mara Tribe, Kenya. A form of African harp built on a calabash. A band from South Africa. Closeup of a Tehardent, a three stringed African chordophone with a carved wood resonant chamber covered with goatskin. An eight stringed Nyatiti Lyre from Kenya. ↑ Catherine Schmidt-Jones, Talking Drums, Connexions. Retrieved January 14, 2008. Kirkegaard, Annemette, and Mai Palmberg. Playing with Identities in Contemporary Music in Africa. Uppsala: Nordic African Institute, 2002. ISBN 9789171064967. Lomax, Alan, and Edwin E. Erickson. Folk Song Style and Culture. New Brunswick: Transaction Books, 1968. Peek, Philip M., and Kwesi Yankah. African Folklore: An Encyclopedia. New York: Routledge, 2004. ISBN 9780415939331. Schmidt-Jones, Catherine. "Talking Drums." Connexions. January 14, 2008. Retrieved July 11, 2008. Tenaille, Frank. Music is the Weapon of the Future: Fifty Years of African Popular Music. Chicago: Lawrence Hill Books, 2002. ISBN 9781556524509. Titon, Jeff Todd. Worlds of Music: An Introduction to the Music of the World's Peoples. New York: Schirmer Books, 1984. ISBN 9780028726007. Tracey, Hugh. The Evolution of African Music and its Function in the Present Day. Johannesburg: Institute for the Study of Man in Africa, 1961. Veal, Michael E. Fela: The Life & Times of an African Musical Icon. Philadelphia: Temple University Press, 2000. ISBN 9781566397650. History of "Music of Africa"
This page was last modified on 1 November 2018, at 16:28.